Home » - Featured Articles » 2018 San Diego Comic-Con: Friday’s Disney-related events! The 2018 San Diego Comic-Con is just almost here today we have a look at the Friday Schedule of Events for July 20, 2018. There’s a few panels that fall under the Disney umbrella and there’s also a few other goings on that Disney fans will enjoy, too. Highlights include: DuckTales; Celebrating 90 Years of Mickey Mouse with D23: the Official Disney Fan Club; and Marvel Television: Marvel’s Cloak & Dagger. There’s a few other goings on that Disney fans might enjoy, including Star Wars Tourism; Women of Star Wars; and Marvel’s Black Panther Costume Designer Ruth Carter: Designing the Costumes of Wakanda. Below are details about some of the events with tangential Disney appeal. Why do people identify with the Evil Queen but not Snow White? Or Elsa and Anna but not Donald Duck or Nemo? Disney characters have been a major influence in culture for the past 90 years. These character preferences inform everything from movie spinoff ideas to game alignment, toy production, and sales. Data were gathered from a study conducted by Keith W. Beard, Psy.D., April Fugett, Ph.D. (professors of psychology, Marshall University), Britani Black,M.A., and Carrie Dean, M.A. (doctoral students, Marshall University) of over 1,000 participants examining personality test results with preferred Disney characters. Findings show how personality informs one’s choices of the Disney characters to identify with and follow. Other topics to be covered are specific personality traits that are associated with liking or disliking specific characters; additional results and other psychological/personality factors, including a review of the most (and least) popular Disney characters based on research results from the last few years; and a comparison between Disney character ratings and several other prominent and popular franchises (such as DC characters, Harry Potter, Walking Dead, Star Wars) in order to better explore overall preference and exposure of some of the most prominent and pervasive pop culture icons of the last 100 years. Did you know The Flintstones started out as a show about hillbillies? Frozen’sAnna and Elsa didn’t start out as sisters? So many of the cartoon characters and storylines you love went through lots of changes to become the versions you know. Panelists will examine some of your favorite movies and cartoon shorts with the artists responsible for creating/developing them, learn about fascinating bumps in the road, and how they got past them. Featuring Floyd Norman(Disney legend, animator and story artist, Sleeping Beauty, Jungle Book), Jane Baer (animator, Sleeping Beauty, Who Framed Roger Rabbit? ), Nik Ranieri(character animator, Who Framed Roger Rabbit?, Beauty and the Beast), Ricardo Delgado (production designer, Atlantis; visual development artist, The Incredibles, Wall-E), Kathy Zielinski (lead animator, The Little Mermaid, Frozen), Aliki Theofilopoulos (supervising producer: Harvey Street Kids, storyboard artist/writer: Phineas and Ferb), Randy Haycock (character animator, The Lion King, Moana), Shadi Petosky (co-creator Danger & Eggs, executive producer: Twelve Forever), and Mindy Johnson (animation historian, author, Ink and Paint: The Women of Walt Disney’s Animation). Moderated by Leslie Combemale(CinemaSiren.com, ASIFA: Hollywood). Star Wars and the law go together like Han Solo and Chewbacca. This panel of judges discuss the legal issues from The Last Jedi, Solo, and unexplored regions from the Outer Rim. Did Luke Skywalker have a legal obligation to save the galaxy from the First Order? What is the legality of underground droid fights? Could the caretakers sue Rey for dropping a boulder on their cart? Was Han right when he shot first? Find out when court is in session with Judge John B. Owensof the Ninth Circuit Court of Appeals, Magistrate Judge Stacie Beckerman,Magistrate Judge Mitch Dembin, CA Judge Carol Najera, NY Judge Matthew Sciarrino, and Paul Grewal (former magistrate judge and now deputy general counsel and VP of litigation at Facebook). Moderated by attorneys Jessica Mederson and Joshua Gilliland of The Legal Geeks. Solve a mystery and rewrite history with the cast of Disney Channel’s hit series DuckTales! Executive producer Matt Youngberg, co-producer/story editor Francisco Angones, art director Sean Jimenez, and series stars Ben Schwartz(House of Lies, Parks and Rec), Bobby Moynihan (Saturday Night Live, We Bare Bears), Danny Pudi (Community, Powerless), Toks Olagundoye (Castle, The Neighbors), and Entertainment Weekly’s Marc Snetiker discuss the mystery of the boys’ missing mom, epic adventures for season 2, and new footage from never-before-seen episodes. It’s a duck blur of fun, action, and secrets revealed in this can’t-miss panel for fans new and old of the world’s most iconic family of ducks! Ever wondered if lightsabers could one day be a reality? Curious about which Star Wars droid NASA would take into space? Is there a form of fuel that could keep The Resistance out of reach from a First Order fleet? Expert panelists Kim Steadman (systems engineer, NASA-JPL), Emily Manor Chapman (systems engineer, NASA-JPL), Kieran Dickson (editor, CometTV.com, MGM Studios), Fon Davis (Star Wars production designer), Travis Langley (editor, Star Wars Psychology), Steve Huff (fight choreographer and weapons expert), Eliot Sirota(VFX expert), and host Jenna Busch (creator, Legion of Leia) act as your Bor Gullet into the mind of Star Wars creators and break down the science behind a galaxy far, far away. Q&As, surprises, and giveaways will follow. From Steamboat Willie to today, Mickey’s career has taken him on an epic journey that has endeared him to fans around the world. D23’s Justin Arthurhosts a panel including Bret Iwan (voice actor), Becky Cline (director, the Walt Disney Archives), and Mark Henn (master Disney animator), who look at Mickey’s legendary roles in animated films and television shows, the Magic Kingdoms, and beyond. San Diego will be getting a little taste of New Orleans! Meet series stars Olivia Holt, Aubrey Joseph, Emma Lahana, Ally Maki, and executive producer/showrunner Joe Pokaski of the new hit summer series that redefined the superhero genre, Marvel’s Cloak & Dagger. Featuring a lively Q&A moderated by executive producer and head of Marvel Television Jeph Loeb,along with a look at exclusive, never-before-been-seen footage. And don’t forget to tune in to watch all-new episodes, Thursdays, 8/7c, on Freeform. From the deserts of Tunisia and California to the glaciers of Norway and the coast of Ireland, Star Wars filming sites are the new travel destination. James Floyd(contributor, Star Wars website and Star Wars Insider), Ash Crossan (host, ET Online), and Charla Teeters-Stewart (director, Imperial County Film Commission) will help you learn about where to go, how to get there, and how to get the most out of it with your fellow Star Wars fans. Ken Bretschneider (CEO, Evermore Park; co-founder, The VOID), Josh Shipley(CCO, Evermore Park; former Walt Disney Imagineer), and Logan Long (creative studio director, Evermore Park; Face Off : multiple season contestant) discuss the creation of this new “living experience park” in Utah. Incorporating authentic European historical architecture, professional prop building, full-body character costuming, and puppetry, Evermore is introducing a fresh spin on fantasy immersive theatre while embracing a strong culture of audience cosplay and interactive role-play. 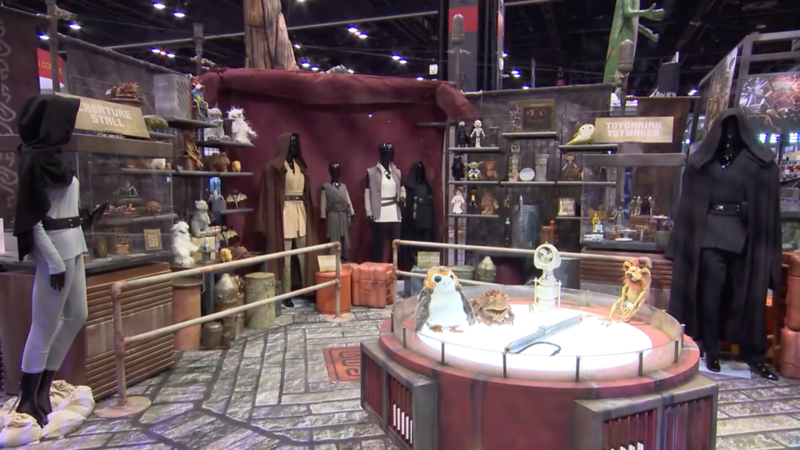 Members of the San Diego Star Wars Society, veteran hosts of trivia panels at Comic-Con International since 2002, have prepared an even more challenging contest this year for fans who think they know the galaxy far, far away. Returning this year will be a game round for kids aged 5 to 11, in which every child will win a prize. Following will be three adult game rounds (ages 12 and up). All game rounds are conducted in a last-man-standing format. Come test your knowledge, and you may win some of the thousands of dollars of prizes provided by Star Wars licensees. Hosted by Leia Hornedo, Linda Crispien, Brendan Prout, Carlos Munoz, Felicia Nykaza, and Collin Gomez. Below are some of the announcements already made for SDCC 2018. Keep an eye here tomorrow for more SDCC announcements! As always, all information is subject to change without notice. Find the full San Diego Comic Con schedule here: comiccon2018.sched.org.